Thursday night, we had the opportunity to see all but eight NFL teams compete in their first preseason game. By Sunday, we will have seen every team in action at least once. Thursday’s massive preseason slate will also signify the two-week mark for most teams in training camp. With double-digit practices to work with and a seemingly unlimited amount of coachspeak predicting breakout seasons, there have been massive spikes in ADP for a host of players. It’s our job here to sift through it and notify you of all the players whose fantasy football ADP no longer makes them a solid investment. Today, we’ll break down the top players at every position who are being undervalued by the public based on their early ADP — in other words, the best current value at every position. After averaging 656 pass attempts over the previous six seasons, Brees threw 536 times in 2017. Predictably, his fantasy football production saw a significant drop despite the fact that he set a career high with a 72 percent completion percentage. Until last season, Brees hasn’t finished outside of the top-six in fantasy scoring at the position since 2005. While the Saints were a run-heavy team in 2017, there’s no guarantee they will repeat a similar plan of attack in 2018. Factors such as Mark Ingram’s suspension and the addition of talent pass-catchers Cameron Meredith and Tre’Quan Smith could also play a role in an uptick in the Saints passing game and Brees’ overall numbers. Goff’s breakout 2017 season is being completely overlooked by his current ADP and the fact that most of the fantasy public is targeting several quarterbacks other than him within his ADP range. Goff finished with the 11th-most fantasy points per game in 2017, the Rams added him one of the best deep threats in the NFL in Brandin Cooks, and Goff has the advantage of entering year two in the same scheme — with arguably the NFL’s best play-caller — and his third season in an NFL offense. The Rams also return all five starters on an offensive line (continuity!) that enters the 2018 season ranked inside our top 10 overall. Despite all the room for growth, Goff is coming off the board as the QB16 overall. Gordon is often overlooked by the fantasy masses because he doesn’t make enough splashy plays. For this reason alone, he is not included in fantasy’s top tier of running backs, but he should be. Gordon is one of the rare workhorse backs in fantasy football who is not only a workhorse from a snap standpoint but also in his involvement in the passing game. Gordon finished in the top-seven of all running backs in targets last season and Chargers head coach Anthony Lynn now wants to use him even more in the passing game. The absence of tight end Hunter Henry should also lead to more of a reliance in the red zone on Gordon, who was already heavily involved in 2017 with the seventh-most carries inside the 5-yard line. The Chargers have added Mike Pouncey at center and will return Forrest Lamp at guard. Both players should make an immediate impact in the run game and on screen passes further helping Gordon’s cause. It appears Howard is viewed as a poor fit for Matt Nagy’s new offensive scheme, but it’s hard for me to figure out why. Howard has averaged nearly 2 yards per carry more on shotgun runs (Nagy will lean more heavily on plays from the shotgun). Meanwhile, those same naysayers claim Tarik Cohen is a better fit for the scheme despite limitations given his size and the fact that Nagy has hinted the second-year back will play more of a Tyreek Hill-esque role in his scheme. All offseason Nagy has backed Howard as a three-down back capable of improving as a receiver in his new scheme. Despite finishing as the RB10 and RB13 in his first two NFL seasons, Howard is coming off the board as the RB17. We’re here for the increased scoring opportunities and targets for Howard in an offense that is set to see positive regression with breakout potential due to its creativity. Josh Gordon was being drafted as the clear-cut WR1 in Cleveland all offseason until he didn’t show up for the start of training camp and has yet to report. Despite the fact that Landry finished as the WR4, WR13, and WR9 overall in his past three seasons, respectively, he is currently coming off the board at an ADP of WR23 — and that is after the Hard Knocks episode 1 boost. Landry has spent all training camp developing a budding rapport with starter Tyrod Taylor. Brown offensive coordinator Todd Haley has plans to use him more downfield and we saw that in the preseason opener. Landry has a much better chance to finish as a target hog than expected and you can get him for the price of a back-end WR2. Hogan is entering year three with Tom Brady in the same Josh McDaniels scheme. The Patriots traded away their only wide receiver to top 100 targets and Julian Edelman is facing a suspension after missing the entire 2017 season with a torn ACL. In fantasy football, volume is king, and Hogan stands to be a key cog in one of the NFL’s most perennially explosive passing games at least until Edelman returns and likely after that. Outside of the late-season game he played hurt, Hogan averaged 13.6 fantasy points per game, which would have put him on track to score within the top-20 at his position over a full season. He is coming off the board as the WR30 overall. Having missed 14 of his last 32 regular-season games, Reed’s recent injury history has taken a toll on his ADP. Despite the tight end position being weaker than ever, Reed is currently being selected as the TE10. Meanwhile, Reed is currently healthy, and the Redskins still have the same Jay Gruden offense in place that made him the focal point and still hasn’t found a target hog at wide receiver. The Redskins also have a quarterback in Alex Smith who has had plenty of career success throwing to the tight end position. Since 2011, Smith leads all quarterbacks (of 31 qualifying) in percentage of pass attempts aimed at tight ends (26.9 percent). 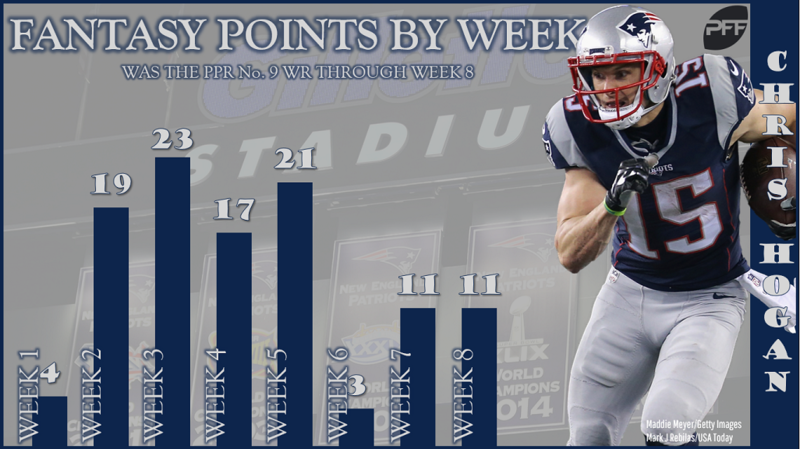 Reed has ranked TE4, TE1, TE1, and TE5 overall in fantasy points per game over the past four seasons, respectively. The upside is certainly there, and the best part is you can pair him with Vernon Davis to help mitigate the injury factor.